This was an eight day cruise around the British Isles. The itinerary called for the ship to stop in Jersey in the Channel Islands; Dublin, Ireland; Londonderry, Northern Ireland and Edinburgh, Scotland. Due to bad weather, the call in Londonderry was canceled. Pacific Princess is a unique ship. She is the smallest ship operated by Princess Cruises, carrying about 650 passengers. Thus, you have Princess-style cruising in an intimate setting. In addition, Pacific Princess is an “R-boat” - - one of eight nearly identical ships that were originally built for Renaissance Cruises. All of her sisters now sail or shortly will be sailing for luxury cruise brands Oceania and Azamara Club Cruises. That tells you something about the quality of the hardware of Pacific Princess. The ship is in good condition. 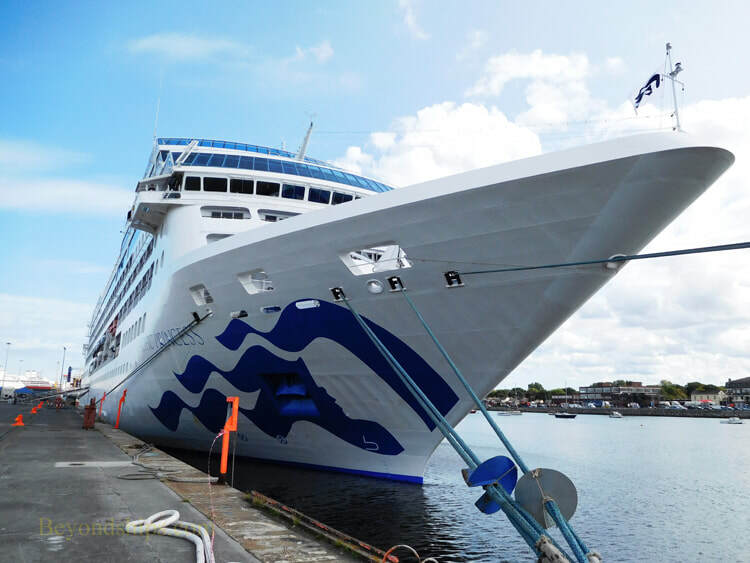 There is no visible rust on the exterior and Pacific Princess looks crisp in her blue and white Princess livery. Having undergone a two-week, multimillion dollar refit earlier this year, the interior looks fresh and clean. The new beds are exceedingly comfortable. Pacific Princess does not have “wow” features. There are no giant slides, things to climb on or tracks on which to race. Rather, it has the basic line-up of cruise ship features – a pool, a spa, a gym, a casino, an internet cafe, a card room as well as bars and lounges. All of these are scaled to suit the size of the ship. Indeed, even the main entertainment venue is a cabaret-style show lounge rather than a theater. Nonetheless, Pacific Princess is a very pleasant place to spend time. Her décor, like that of the other R-boats, is a tasteful, country club style. The public rooms have the feel of conservative luxury. Furthermore, the public areas are well-arranged and it is easy to get about quickly. The oceanview cabin that I had during this voyage was spacious and a pleasant place to be. Of course, good hardware is not enough to make a good cruise, you also need a good crew. On Pacific Princess, the atmosphere is relaxed and I was impressed by the friendliness of the crew. They quickly learned my name and knew my preferences in the dining room. The main dining room operates on an open seating basis for breakfast and lunch. For dinner, Pacific Princess follows the traditional two-seating system in which each guests is assigned to a table at either the early of the late seating. Unlike the larger Princess ships, there was no flex-dining option. I enjoyed the food in the main dining room. The quality and variety were very good. Also, the dinner menu offers a number of favorites that are always available. Thus, even if you do not like the items that vary each night, chances are good you will still get a good meal. Inasmuch as this was a British Isles cruise, afternoon tea was highly appropriate. I had tea both in the buffet and in the main dining room. Both were quite good, especially the scones. The problem with the buffet is that it is self-serve and there is nothing to prevent you from keeping going back for more. In the main dining room, there is at least the embarrassment factor associated with asking for more. ​Pacific Princess is no ocean greyhound. Her top speed is 20 knots. However, she was able to handle the bad weather we encountered off Northern Ireland and deliver a comfortable ride. Turning to the ports, Jersey was a tender port. The tender operation was efficient both going into and out of St. Hellier, the island's capital. In Dublin, we docked at the North Wall Quay Extension, which is the berth closest to the city center. A free shuttle bus took passengers between the cruise port and Merrion Square. However, the bus got caught in morning traffic and so the trip took longer than it should have given the distance. As a result, inasmuch as it was a beautiful day, I decided to walk back to the ship along the banks of the Liffey. It is a long but interesting walk. Getting through the traffic by the cruise port, however, can be rather dangerous. Most large cruise ships have to tender in Edinburgh. Indeed, we could see Caribbean Princess tendering when we were there. However, lowering her mast, Pacific Princess was able to make it under the Forth bridges and dock at Rosyth, which is not far outside Edinburgh. The port is a former Royal Navy base that is now used primarily for commercial purposes. (The aircraft carrier Prince of Wales could be seen under construction in another part of the port). Guests exploring this stop independently could either take a free shuttle to the terminal building or take a pay shuttle to the nearby railroad station. For security and safety reasons, guests could not walk around the port. Taxis were available at the terminal building. The train into the city center took about half an hour. The Edinburgh Festival was on so Pacific Princess did not sail until after midnight. This was to give the guests a full day and an evening in Edinburgh. Many guests went to see the Edinburgh Military Tattoo arranged through the shore excursions office.